However, she didn’t dip her toes into comedy officially until years later. Houlihan, 26, studied painting at the San Francisco Art Institute. Though she’s not as focused on fine art nowadays, she still paints, illustrates, and animates. “I did some animation when I was in college and I liked that so much. I didn’t really like going to galleries,” she says. “I wouldn’t mind paintings in galleries, obviously, but I think anytime there’s a video in a gallery no one spends time with it.” Instead, she felt drawn to television and online videos, such as the experimental animation of Adult Swim. Following the path of actors from The Office and the like, Houlihan moved to New York after college and started with the common route of the Upright Citizens Brigade. 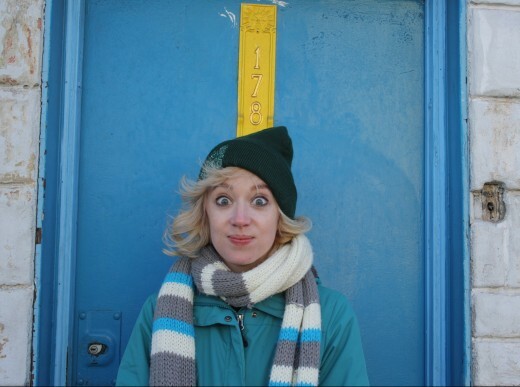 After a year of classes, she auditioned for their sketch and improv teams, but to no avail. Instead, she started doing stand-up (“It’s free. Why not?”) and began connecting with people who had similar tastes and styles. 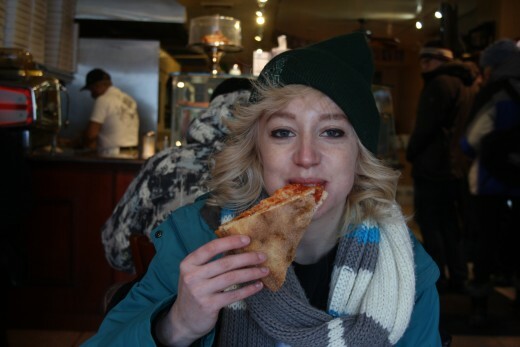 She found a home in the “alt-comedy” scene largely centered in Williamsburg. 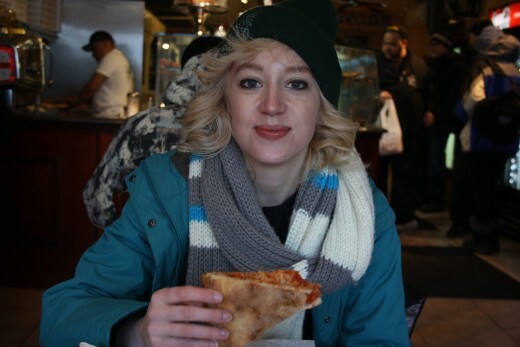 Though she sometimes feels puzzled by the “alt” characterization, finding that the material she and her colleagues generate seems tonally fitting for commercial shows like SNL and Conan, she is more than satisfied with the community she’s found. Lately, she’s been doing a little less stand-up and more longform shows. Cartoon Monsoon, the show she hosts every month at The Annoyance with Joe Rumrill, is an hourlong “episode” featuring puppets, characters, and animation. Live ’N’ Good, her one-woman show, is similarly multidisciplinary. She built it by crafting “a loose and dumb story” to serve as the framework for sketches, stand-up, and videos to happen. “I just wanted to do a big long show that was kind of a challenge for myself,” she says. “So in the summer, I just was like, well, I’ll book a date and it’ll have to get done by then otherwise I’ll look stupid.” The last show was at Union Hall in Park Slope and featured Houlihan with backup dancers who accidentally get into a car crash, a man coming in to do his one-man show during her timeslot, and the aforementioned backup dancers getting revived after a brief ten-minute death. Though this Live ’N’ Good is mostly new, one character that doesn’t seem to be leaving Houlihan’s repertoire is Hot Mary, a crop-top wearing long-haired girl that originated in a video she made with her friends. A far cry from the typical parody of a “hot girl,” Hot Mary possesses a delightful oddness that’s refreshing in its absurdity. Rather than taking the easy route of reducing her to a one-dimensional wisp and focusing on appearance and superficiality, Houlihan is much more interested in the ways she can instead flesh out the “hot girl” character in new and odd ways. And if you can’t make the show tonight, fear not. There’ll more than likely be another chance. Houlihan says she’s certainly interested in doing the show again, as she’s become quite taken with longform, plot-based comedy shows. 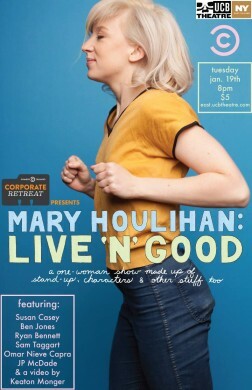 ‘Mary Houlihan: Live ’N’ Good’, co-presented by Comedy Central’s Corporate Retreat, is tonight at UCB East, 153 E 3rd Street, East Village. 8pm. $5. More info here. The next ‘Cartoon Monsoon’ show is on January 30th at The Annoyance Theater, 367 Bedford Avenue, Williamsburg. More info here.